About thirty million U.S. adults have obstructive sleep apnea (OSA), a condition associated with stroke, heart disease, and neurocognitive dysfunction, among other serious conditions—and its prevalence is on the rise. The gold standard for diagnosing OSA is the polysomnogram, an overnight study that monitors various factors, such as airflow and oxygen, during sleep. But the procedure is costly and usually has a long waiting list. Meanwhile, many people with sleep apnea don’t receive medical attention at all, because they aren’t aware of or don’t exhibit the common symptoms, which can include excessive daytime sleepiness, snoring, excessive nighttime urination, and diminished concentration. As obesity rates rise, more people are being diagnosed with OSA, as carrying extra weight can lead to breathing issues during sleep. For all these reasons, researchers from the School of Dental Medicine and the School of Medicine—and the associated Center for Sleep Medicine at Tufts Medical Center—have come together to find new ways to improve diagnosis and monitoring of the condition. With the help of a Tufts Collaborates grant, the team will examine blood samples from subjects participating in a pilot study to pinpoint biomarkers for OSA. 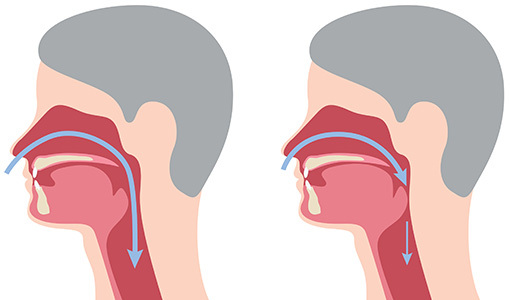 Here’s how the forthcoming study will work: Tufts researchers will measure patients’ plasma extracellular miRNA—small non-coding RNA molecules—which are markedly altered by the hypoxia, or oxygen deficiency, caused by sleep apnea. They will then compare the Ex-miRNA before and after the patients’ use of a common therapy for sleep apnea, the continuous positive airway pressure device, or CPAP, over the course of ninety days. Through this, the researchers hope to discover the components in the blood that best measure the response to CPAP therapy. Down the road, this research could lead to a blood test akin to the HbA1c, an important diagnostic tool used for evaluating long-term blood glucose control in diabetic patients and identifying patients at risk for diabetes.